I do so enjoy it when pictures I take end up in photoblogs. Today, one I submitted: An amazing parking job over on Bad Parking. Really, it’s impressive. The guy parked with precision. And of course, there’s the classic fireman cake, which Scott blogged about at Basic Instructions, and found some internet fame after being reposted to Cake Wrecks. 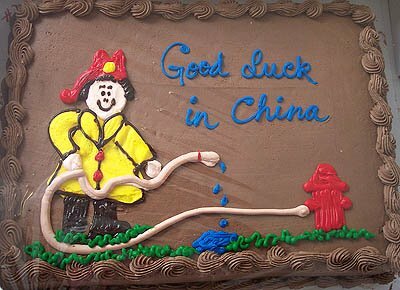 Costco no longer has the fireman as an option for cake-based graphics. So we’ll never see that recipe again. Technically, I’ve made Cake Wrecks twice — recently they posted a post full of watermelon cakes, one of which is mine. I got a picture of it at our old Albertson’s grocery store. I wonder if their cakes are why all of the Albertson’s stores in this town closed down.